If you want to grab a drink in the same watering hole as Jacques Strap, Anita Bath, and Maya Buttreeks, you're in luck. 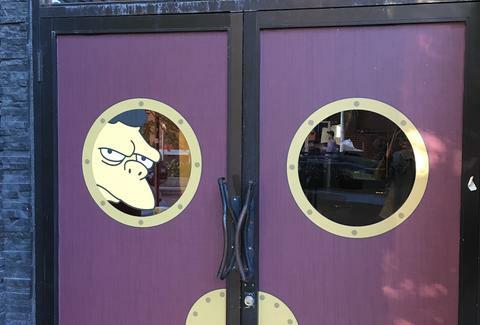 Chicago's Replay Lincoln Park has dressed its rear bar up as Moe's Tavern from The Simpsons. The arcade bar has been given a makeover that will kitsch it up through Halloween. TVs will play Kent Brockman reels, faux Duff Beer is on tap, and Simpsons-themed cocktails are on the menu, including a Flaming Moe and Frozen Squishee. Even better, customers are getting free Duff Beer coozies, and there will be a live Duffman making an appearance for all your urgent Instagram needs. Also making an appearance will be the bar's classic Simpsons four-player arcade game and Simpsons pinball. On top of all of that, the bar is littered with Simpsons references, like Mount Lushmore and a poster advertising a bout featuring Kid Moe, his fourth and final boxing moniker after Kid Gorgeous, Kid Presentable, and Kid Gruesome. Even the drink menu is loaded with easter eggs like Skittle Brau and a plum floating in perfume served in a man's hat. The pop-up opens at 5pm Monday through Thursday, 3pm on Fridays, and noon on Saturdays and Sundays. Moe's Tavern pop up at #Replay for Halloween! Nothing like some Duff's and Flaming Moe's! Had a blast but Spoiler Alert Flaming Moe's are terrible! !